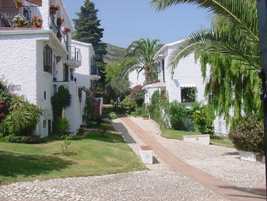 We offer villas and apartments in many different areas of Nerja. Here is a brief explanation of the areas where you can rent a holiday property with SpainAway. El Capistrano Village was built to replicate a traditional Andalucian "pueblo blanco" or "white village", with whitewashed houses on narrow streets, and beautiful gardens with a year-round display of colour from the many trees, flowers and tropical plants that grow there. There are now 5 separate Capistrano developments within a short distance of each other, and each one is built in this same traditional style. Find out more about Capistrano from our Capistrano Guide. Burriana is the largest and most famous of Nerja's beaches, and is composed of a mix of fine sand and pebbles. There are a wide-range of restaurants, cafes and shops on the beach front, many of which serve delicious fresh fish and seafood. Burriana Beach was again awarded the prestigious Blue Flag award in 2006 and in addition to this, it is one of only 2 beaches in the whole of Andalucia to have won a 'Q-Standard Quality Award' for its fantastic quality and cleanliness. Palm umbrellas and sunbeds can be hired here as well as pedalos in high season. There are also water sports and other activities on offer such as scuba-diving and day cruises along the coast. From Burriana Beach it is only a 10-15 minute walk to the Balcón de Europa, the very centre of Nerja. Torrecilla Beach is Nerja's second Blue Flag beach, along with Burriana Beach. This is probably Nerja's second most popular beach, on the other side of town from Burriana Beach. It has been artificially widened to create a perfect beach for young children with shallow and generally calm water, and soft sand. Sun-beds and umbrellas can be hired here. Torrecilla Beach is on the edge of the town centre, with plenty of restaurants and cafés in the vicinity. It is also less than 5 minutes walk from here to the Balcón de Europa at the very heart of Nerja, meaning that you can enjoy both the beach and the town, without the need for a car. Carabeo beach is found along the coastal promenade (Paseo de los Carabineros) which runs from the Balcón to Playa Burriana (although the last part of this is now closed due to unstable cliffs). It can be reached either from this coastal path or from the end of Carabeo Street via a flight of steps. Carabeo Street leads to the Balcón de Europa, making this an extremely central location to stay in. A wide variety of shops, bars and restaurants are all within a couple of minutes walk. Carabeo beach is just below the street and Nerja's many other beaches are also within easy walking distance. All this makes Carabeo an ideal location to enjoy both the town and the beach, without the need for a car. The ‘Parador Area’ of town is what the area around the exclusive Parador Hotel is called. This is an ideal location as it is within a quiet residential district, whilst only being 5-10 minute walk to Burriana Beach , Carabeo Beach and the centre of Nerja itself. Enjoy all the benefits of being close to the beaches, restaurants and shops, whilst not being in the centre of all the hustle and bustle.